• How much time do you have to spend in the yard each week? • What is your budget for this project? • Do you have favorite flowers or plants you would like to include? • Are you physically able to maintain your landscape, or do you require low-maintenance shrubs and plants? • What are your favorite colors that you would like to see incorporated into your landscape? When designing your landscape, use repetition to create organization. If you plant daylilies on one side of your yard, for example, also plant them on the other side to create uniformity. Break up sections of your landscape with different colors or textures using ornamental grasses, perennials and plants that grow to different heights. Avoid planting flowers and plants close together as you may find that in a year or two, your layout has become overgrown and crowded. Space plants based on the recommended planting instructions on the plant tag, which usually falls within a range of 1 to 3 feet apart, depending on the plant. Also remember to trim them as they grow. Use color to create focal points in areas that you would like to highlight, such as a sitting area, gazebo or front entry area of your home. Use flowers or other types of plants that grow higher closer to your home, and plants that grow to lower heights in front of them so they are visible. However, avoid planting large-growing plants in front of windows to avoid a potential uprooting project in the future. Also use evergreen shrubs as a foundation plant rather than deciduous shrubs. You can add variation with a nice specimen tree. You can also use landscaping accessories to break up your yard, such as boulders, birdbaths, benches or gazing balls. Theme gardens are also popular, so consider adding a rock, Japanese or butterfly garden to complete your landscape. If you are a novice, don’t plan for a top-of-the-line landscape with a formal English air and perfectly trimmed hedges, spot-on pruning and zero weeds. Instead, use informal hedges and flowers that require less pruning. 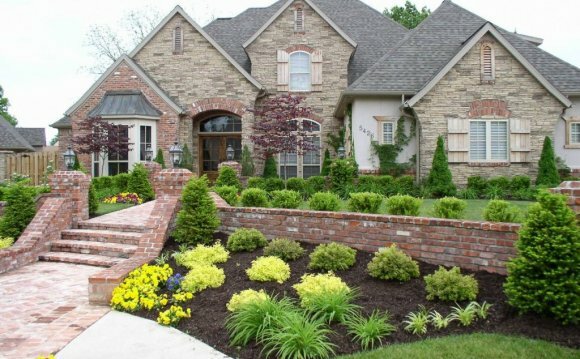 Opt for more grass and fewer flowerbeds or throw in a rock garden. You can also ask an associate at your local store for ground cover varieties that can provide greenery that rarely needs mowing. Hardy plants that thrive in whatever sun conditions you may have are also available. Don’t randomly place flowers and plants on a whim. Avoid scattered placements so that you don’t end up with a mismatched or cluttered look. Keep your lawn around 2 to 3 inches tall, which is typically the highest setting on most push mowers. Removing more than one-third of the grass blades leads to shorter root systems and moisture depletion. Weeds germinate more when grass is not tall enough to shade them out. Combat any brown patchy spots by reseeding and adding fertilizer. Weeds tend to grow, well, like a weed. If you see a dandelion or crab grass, break out the weed killer spray to attack the roots so new weeds won’t sprout up. Barren patches in your lawn are perfect spots for weeds to grow, so use a fertilizer on them with built-in weed control. Make sure you choose plants that match the climate where you live. Check the plant tags for advice on hardiness, height, spacing, feeding, watering and preferred light. Picture the plant five years into the future. How tall is it? How wide is it? Does it fill the allotted space? If not, pick another plant. When choosing areas for plants, think tall to small. Start with taller plants, and gradually fill out your landscaping area with smaller plants. Don’t place sun-loving plants in the path of taller neighbors. Keep in mind that fast-growing plants may block the sun with their large size. Place shade-loving plants facing north. Expect hardy varieties to grow bigger once planted in the ground. Aim to plant them 2 to 3 feet apart. Water lines, sewer pipes and septic tanks can be compromised by roots. Be especially weary of large vines, willow and locust trees. Roots can penetrate tiny gaps in underground pipes and cause major damage. Know exactly where your electric, phone, cable and gas lines are before planting. Call your local utility companies before you dig to ensure your safety. What looks like a tiny sapling may sprout roots that can grow up to three times the height of a tree. A tree planted near your home can cause cracks in your foundation, leading to costly repairs. Plant medium or large trees 30 to 50 feet away from the house, and small trees 15 feet away. If you have an overgrown or outdated landscape, there is nothing wrong with removing shrubs, hedges, plants or flowers, especially if they are too big for a particular area. A great way to uproot unwanted greenery is with Stump-Out, which works in four to six weeks. At that time, finish the job with a shovel and a hoe to cut roots below the surface.